I'm almost done with Divine Darkness - Dark Goddess. The last book in the series will be out in October. I hate to say goodbye to Hayden and Hartley. Their's was the very first story I told and this ending is definitely bittersweet for me. The cover reveal is tomorrow September 29 so stop by and check it out! Another last I'm working on is the final book in the Secret Salem series. I'm shooting for a late fall, early winter release date. Every time I start working on this one I get a little teary-eyed. More details to come on both of these books. 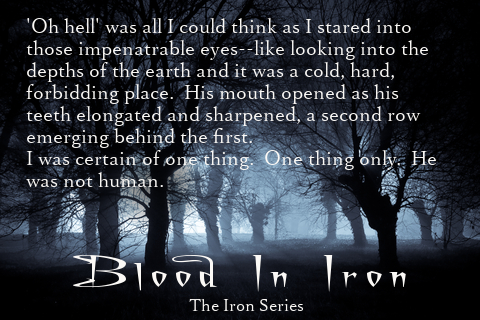 While you're waiting for these books to release, if you haven't already get the first in my new series Blood In Iron (The Iron Series Book 1). Um... it's also almost October, meaning the countdown to HALLOWEEN is about to commence. HA!!!!! Can't wait.